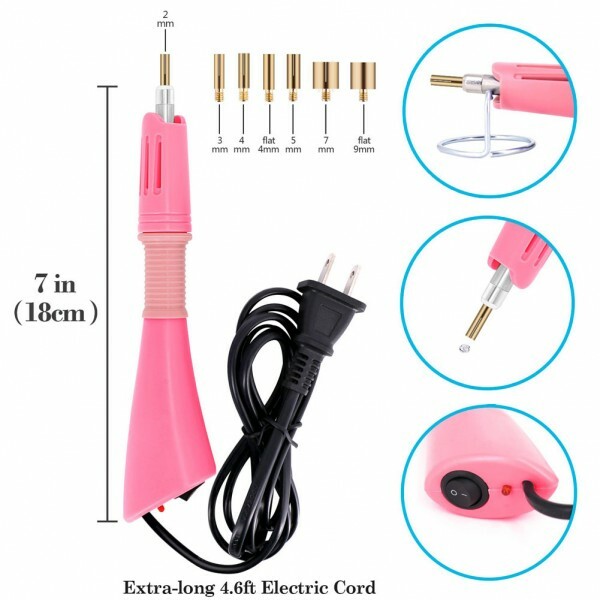 *This is a DIY Hot-Fix rhinestone applicator that can add sparkle rhinestones to your items including clothing, purses, cell phones, belts, dolls, scrapbooks and more. It works with those materials need to be able to absorb the adhesive when it’s melted, like Leather, Paper, Card, Wool-Trevira, Cotton, Linen, Wool, Viscose, Tulle, Denim, Lycra, Cotton Jersey, Silk, Synthetics (polyester etc). *This Hot-fix Applicator has an on/off switch with red LED indicator, comfort grip handle, and extra-long 4.6ft electric cord. Fast heat up time and quality made. Complete with a Safety Stand and 7 Different Applicator Tips for applying different sized Hot Fix Crystals. 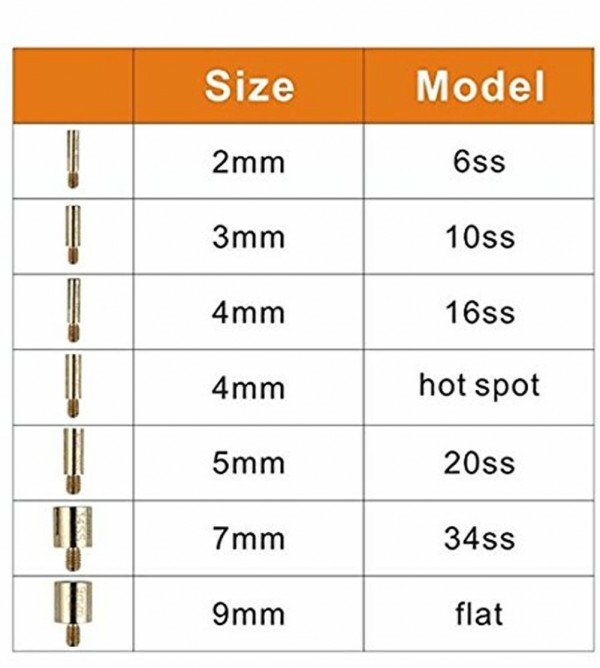 7 Hot-fix Tips: 1 x 2mm tip, 1 x 3mm tip, 1 x 4mm tip, 1 x 5mm tip, 1 x 7mm tip, 1 x 9mm flat tip, 1 x hot spot tip. 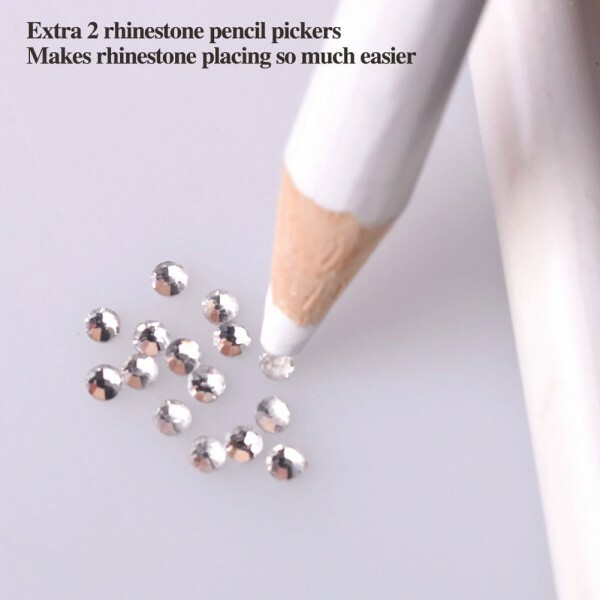 *Jewel Tweezers & Cleaning Brush: These tweezers are perfect for working with rhinestones and small sequins when you're creating intricate details; after applying the rhinestones, the tips will be sticky with glue. 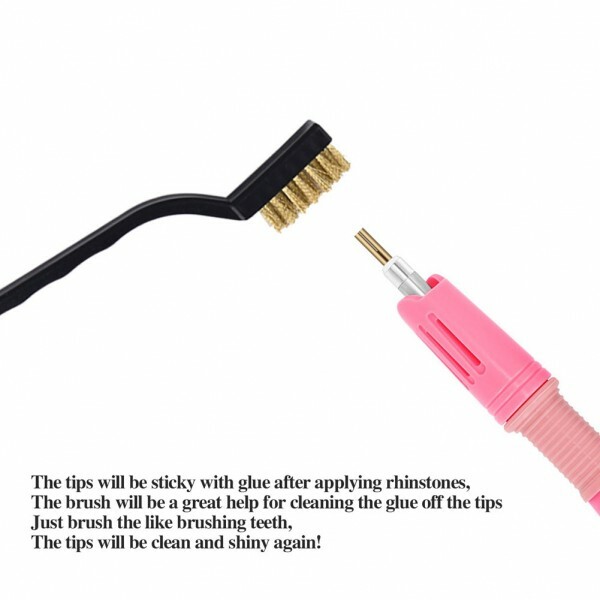 The Brush will be a great help for cleaning the glue off the tips. 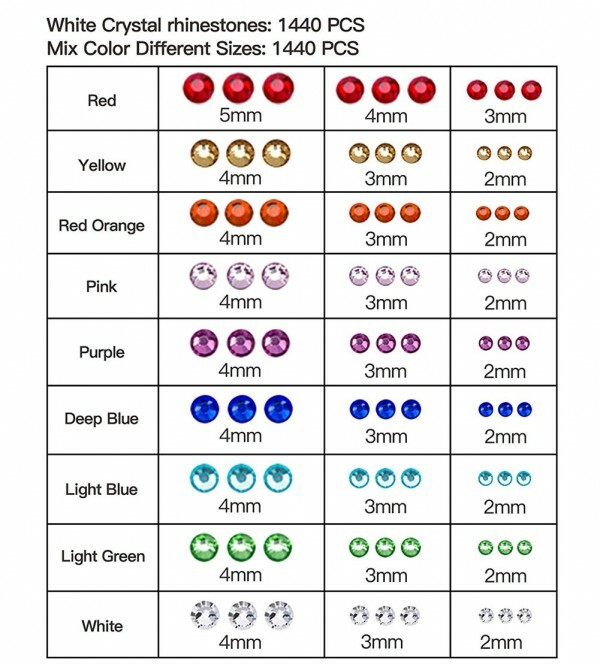 *2 Pack Hotfix Rhinestones included: 1 pack 4mm crystal white rhinestones; 1 pack multi-color rhinestones in mixed sizes, 1440 stones/each pack. 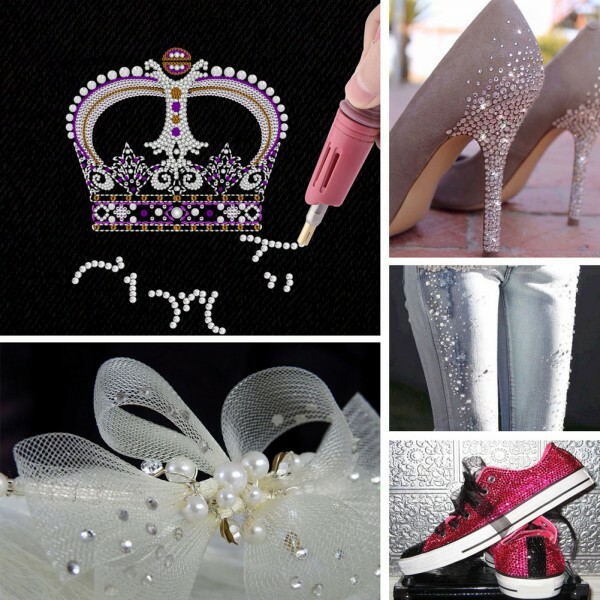 And make sure the rhinestones you will apply is Hot-Fix style with Hot-Fix glue on the background when you purchasing from other places. 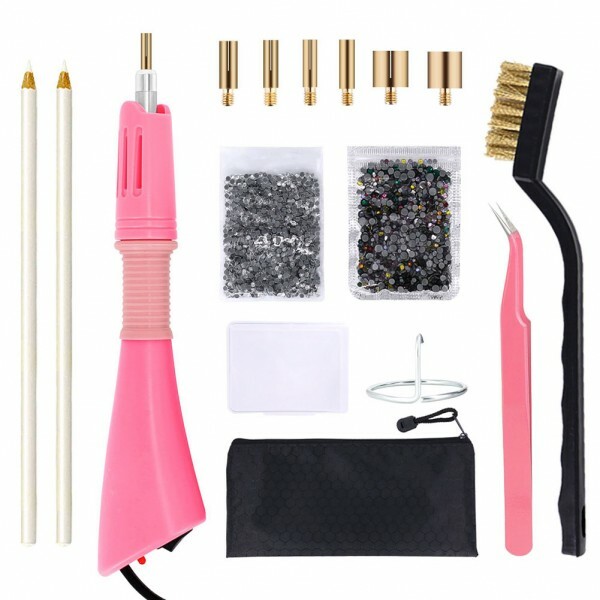 *The Hotfix Applicator Kit Includes 1 Hot Fix Applicator, 7 Hot-fix Tips,2 Rhinestone Pencil Pickers, 1 Support Stand, 1 Jewel Tweezers, 1 Cleaning Brush, 2 Pack Hotfix Crystal Rhinestones (1440 pcs/pack), 1 Plastic Boxe and 1 Nylon Carry Sleeve.